Ralph Cook left our world on September 16, 2011 to be with his heavenly father. He will be joining others that have passed before him: Father, Robert Cook; mother, Georgia Cook; sister-in-law, Martha Hankins; son-in-law, Stephen Mondello; along with many others. Mr. Cook was a Sergeant in the Army. He was in the invasion of Normandy with the 508th Paratroopers. He received a Purple Heart during his combat service, along with several other commendations. Upon completing his service, he returned to Greenbriar, Arkansas and married Mary Lou Thomas. They were married 60 years. He has been a member of Myrtle Grove Baptist Church since moving to Pensacola in 1954. Besides his loving wife, he is survived by: Children - William (Ellen) Scott of Pensacola, Karon (Jim) Epley of Jacksonville, FL, Melody Mondello and Ralph Everett Cook of Pensacola; grandchildren - Whitney (Stuart) Whitman, Lindsay Cook, Ryan Mondello, Angela Mondello, Adam Cook and Joshua White; great grandchildren - Alyssa Edwards, Bryce and Ashton Cook; sisters Dorothy Cantrell and Bobby Jo Carmichael of Conway, AR. 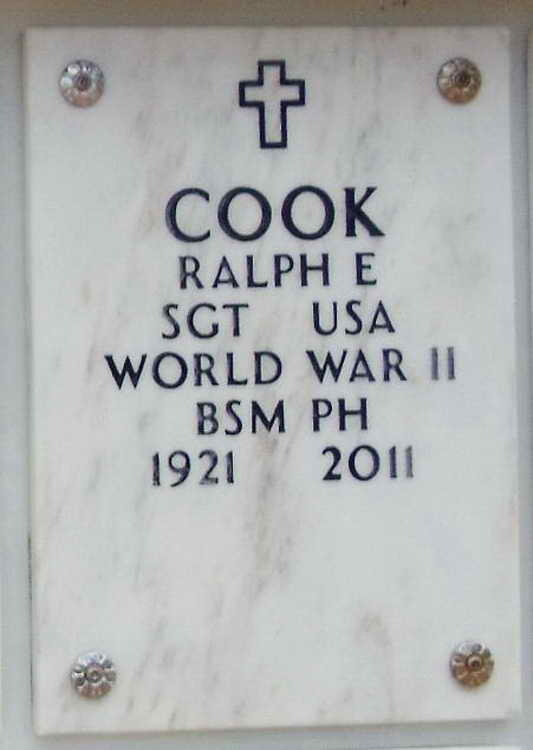 Niche marker for Ralph E. Cook in Section B-5 Row A Site 9 of the Barrancas National Cemetery, Naval Air Station, Pensacola, FL.